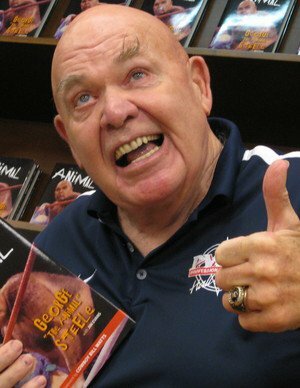 William James Myers, better known by his ring name George "The Animal" Steele, is a former American professional wrestler, author, and actor. Steele s career lasted from 1967 until 1988, though he made occasional wrestling appearances into the 1990s and 2000s. He also portrayed Swedish wrestler/actor Tor Johnson in Ed Wood, directed by Tim Burton and starring Johnny Depp. From Wikipedia, the free encyclopedia. Description above from the Wikipedia article William James Myers, licensed under CC-BY-SA, full list of contributors on Wikipedia.